Adventures in the Endless Pursuit of Entertainment: Broadway Barks 11 is July 11th in Shubert Alley! 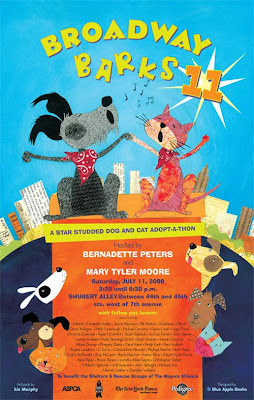 Broadway Barks 11 is July 11th in Shubert Alley! Eleven is the lucky number for Broadway Barks as it celebrates its 11th anniversary in Shubert Alley this Saturday, July 11th! Broadway Barks, founded by Bernadette Peters and Mary Tyler Moore, benefits New York City animal shelters and adoption agencies by raising money and awareness, as well as promoting adoption of shelter animals. The celebration begins with Bernadette signing her delightful children's book, a New York Times Bestseller, Broadway Barks, at 1:00 in Shubert Alley. At 3:30, an auction of cool stuff and celebrity-autographed memorabilia will begin. I can't go! I want a pet too much and the temptation will be too great! Roxie, sure you can come - they don't olet you take home a pet that easily anyway. It's almost harder to adopt a pet in NYC than it is a baby. I am excited to see Nigel! It kills me that I can never even submit an application to adopt a pet; but in fairness I know I work and play too far from Staten Island to be home for proper care of an animal. Hahaa I always thought you could just adopt one right there. For the best, probably!